Papua New Guinea is one of the last unspoiled lands for the adventurous traveler. Meet fascinating tribes, enjoy some of the world’s best bird-watching, and journey through a varied and inspiring countryside, where no two provinces are alike. Papua New Guinea offers visitors a glimpse of mountainous highlands, fertile valleys, the might Sepik River, coral atolls and some of the best diving locations in the world. Papua New Guinea is a country of wild beauty, breathtaking landscapes, and fascinating flora and fauna. Explore the mystical Sepik Region – one of the world’s largest waterways! Observe the intact tribal culture, customs, animistic beliefs, art, and sorcery of the flamboyant tribes here, who are skilled carvers and weavers. Attend the Goroka Show. 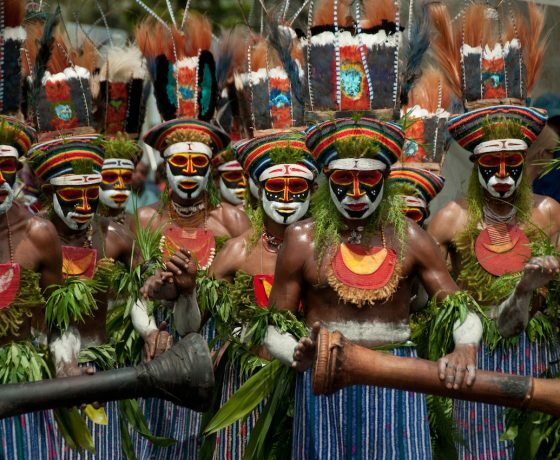 Nicknamed “the most colorful show on earth,” Goroka showcases singsings (traditional songs, dances and ritual performances) from over a hundred tribes. In the mid-Sepik region visit the Spirit House of a regional clan to meet the local chief and his initiated men. See men playing large, wooden Garamut drums made of hollowed-out logs, and witness a deeply intimate ritual ceremony. Enjoy nature walks amidst a landscape of lush high valleys wedged between towering limestone peaks, endless tropical forests and fertile plains, as you listen to the ever-present sounds of the forest birds.